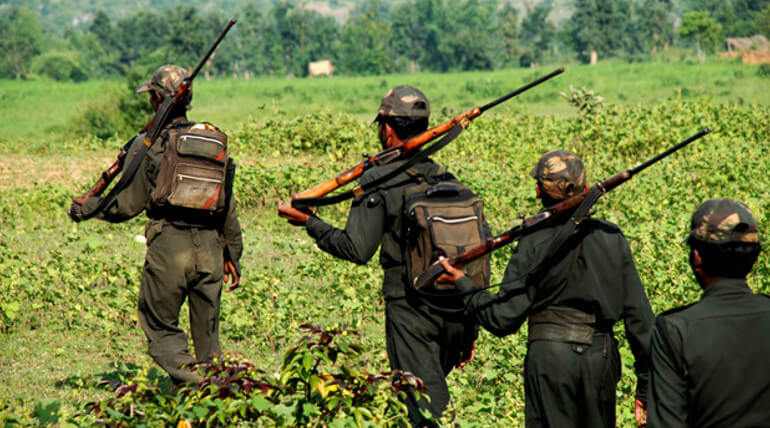 Two Naxals were shot dead in a retaliation fight at Chhattisghar. Two naxals including a woman, were killed at Muduvandi - Kawadgaon forest at Chhattisghar's Bijapur district. Both were shot dead by the commandos of Anti-Maoist operation. It was held as a joint team operation said Mr. P. Sundarraj, DIG of South Bastar range. A battalion of two groups had been sent in for the searching of naxals this morning. The group includes CRPF's special unit called COBRA 204th battalion and District Reserve Guards (DRG). The DIG continued, the battalion was sent in on Thursday night in search of naxals. On their mid way in to the Gangaloor forest, today morning naxals opened fire on them and hence the security forces started retaliation on naxals. They started searching operation after the fight and found two dead bodies in militant uniform and weapons beside them. They ceased a 303 rifle, a 12 bore gun and a country made pistol. The operation is still on, further information will be given according to the operation later said the DIG. The Naxals are said to be playing the major role in the Dalit riot at Bhima Koregeon. Security Agencies said Naxalites may infiltrated in the riot of Maharashtra and boosted them up in order to create chaos is to be noted.